I am a person who loves to call a spade a spade when indeed it is an actual spade. 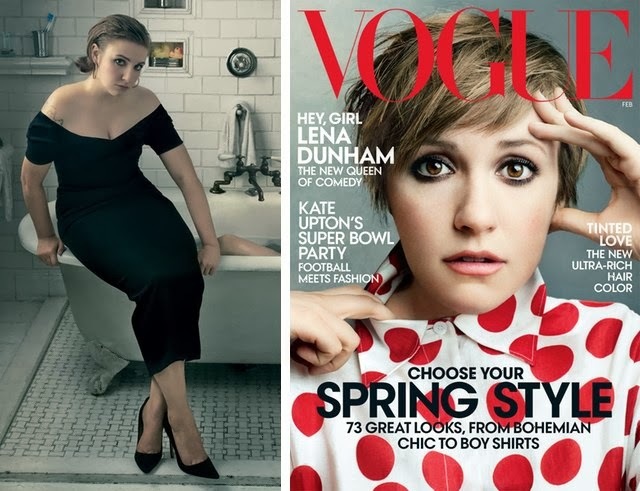 I'm a little confused about the Lena Dunham Vogue controversy. Earlier this week I saw Lena on the cover and thought, nice cover and she looks like herself. In my mind, and correct me if I'm wrong, there is no controversy. There is some photoshop, but in my opinion, it's minimal. (Besides them cutting off her arm. Vogue, I'm gonna need yall to do better.) Yes, they touched her up. It's Vogue, what do you expect, but I've seen photos touched up (in the plus size fashion community, I might add) much worse than this. When situations like this happen, go viral, or whatever I often wonder to myself are there times where we are too sensitive. Anytime a "regular" girl is highlighted it seems that people are just waiting to find something wrong with it so they put it under a microscope, dissect, and milk it for all it's worth. The same with the Mindy Kaling cover. I thought Mindy was gorgeous, but apparently I was supposed to see some slight against her size and ethnicity that didn't occur to me. For me, I always want to fight the good fight, but I only want to fight when they is an actual fight. I do feel like some folks/websites are always ready to pick a fight when there is none. This also makes me question the authenticity of their motives. Could this be a ploy, to say, go viral. As I like to say, the thirst is real. As this not my usual type of post, I felt like voicing my opinion and having a conversation and I would love to hear your thoughts. Update: If you've been keeping up with this whole "controversy" and I used that term very loosely, Jezebel paid 10K for the untouched photos of Lena Dunham. In response to this obvious waste of money and counter production of female empowerment, Brad Walsh & fellow blogger, Nicolette Mason, have decided raise 10K to give Step Up. 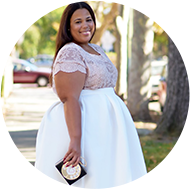 The mission of Step Up is to propel girls from under-resourced communities to fulfill their potential by empowering them to become confident, college-bound, career-focused and ready to join the next generation of professional womI am always here for such causes. Want to help as well. Make a donation today, big or small, here. I, personally, am not a fan of Lena (just not my cup of tea), but the controversy and Jezebel's "hunt" for the retouched photos is all lame. I don't expect a lot from Vogue, including how/who they put on the cover so I guess that's why I'm "meh" to it all. I kind of understand Mindy's Elle cover because I don't understand why they made her cover the only black and white/headshot one. However, she doesn't seem bothered so if she's happy I'm happy. I'm just waiting for Gabourey Sidibe to hit the cover. It can happen, right? If Gabourey has a cover then I think the internet will blow up! Oh my God! My facebook page was just ignorant. OMG! I can't. I'm telling you the internet would just blow up...no more internet...FOR ANYBODY! The comments were ridiculous. Her tweet made my day. I was just like, "Yes ma'am!" The Internet is part of my work and sometimes I wish it could be unplugged for a day and make everyone go in a timeout or sorts. I looked at both this cover and Mindy's and thought "is there something wrong?" Cause I didn't see it. I honestly think people just want to find something to complain about. I didn't see anything wrong with the Mindy cover or this one. Would people rather not curvy women on the covers at all, because when we are there is still something "wrong". I don't know if it was a slow news day at Jezebel or what but for some reason Lena being on the cover of Vogue annoyed them. They decided she was being "real" or authentic or some such nonsense and this was their version of calling Lena and I guess Vogue out. News flash,pretty much every magazine out there uses some level of photoshop so I don't get the big woop. Nobody cared about untouched pics, cause we know they exist. Duh! As for the Mindy cover. I was only low key annoyed by it. She did indeed look pretty, probably the prettiest I have ever seen her. Still there's something unsettling about doing a 4 cover issue and the only cover rendered in black & white is the one featuring a person of color. It's also disconcerting to have the only close cropped face photo be the one who's over a size 2. Nonetheless at the end of the day Mindy liked the cover so I'm not getting crazy upset by it. You know if Melissa McCarthy had not been featured on the cover of Elle in full body pose a few months previously then maybe I would think something, but I didn't just because of this fact. I think you also bring up an excellent point. Mindy liked the cover! If she was complaining that would be one thing, but she liked it. I think Jezebel was having a low news days. Fashion is fantasy. That's what is fun about it. Take away that aspect and all you have is people getting dressed. Sooo I missed this entire drama at work today, but wow when I caught up I was really blown away. First I don't get the drama set all! Whose not airbrushed?! Hell I airbrushed my bosses picture the other day! If I was in Vogue and they didn't take care if my blemishes I would be pissed! I just don't get it. She looks great and I wasn't been a fan of her being in Vogue, but I had to bite my words because the styling and artistic direction was amazing. I just don't know what Jezebel was thinking, what the purpose was. Creating new drama and I guess driving people to the site? Ugh I could go on and on about this. I would be mad too if they let a pimple ride LOLOL...it's like what's the point in being in Vogue if you can't look like it! I was quite stunned about this, I mean, its Vogue, you kind of know it's going to have some retouching. Plus, it's shot by Annie Leibovitz, what do you expect! I don't think they went OTT with retouching, but it seems that they wanted to make a big deal out of it. It seems the world is full of people who like to make mountains out of mole hills. Well, it was all kind of weird b/c Jezebel adores Lena Dunham and all of her problematic behavior and the article actually said she looked great (which I strongly disagree...she has never looked great anywhere), so I'm not sure what they wanted to prove. But Jezebel is not the most consistent or logical place on the internet. I think she's gorgeous on the cover. I find the controversy kind of childish. ALL of the big fashion magazines photo-shop. And not just plus-size girls, either. I've seen Kate freaking Moss photo-shopped!! Lena goes full-tilt-boogie naked in her show, prancing and dancing in her gorgeous skin and that's why I love her. I've never seen anyone in Hollyweird with such awesome body confidence. It makes me happy just to watch her. I applaud her for the balls to be herself in a world of cookie cutter, stick-thin actors. I say, "You go, girl!" xo PS: Great blog, Chastity. You rock, too!! Personally, Vogue is in the business of beautiful pictures happen, creating a fashion fantasy and selling that dream. The untouched photo of Lena, while not horrible, is not something I would put in Vogue without some editing. Just as an author carefully crafts and edits their piece, so must a photographer. This is the physical representation of their work. While yes, there was some slimming and tightening, I think they offered her up as close to her real self as they could. Now, when they add Melissa McCarthy or Adele without a huge photoshopping presence or covering her up in a muumuu, then even better. But, for now, I will take this small gesture from the fashion bible and continue to have hope. Because, honestly, without hope and promise, why bother?? This "controversy" is ridiculous and continues to create a hostile and venomous online social environment. I am so tired of people looking for a fight or reason to be offended.... DONE. I definitely agree, Jezebel is thirsty and really grasping at this one. I'm a retoucher, and I don't agree with all the retouching some magazines do especially on covers but people need to understand that it's about the art, retouchers are fixing the photos, not the models. No retoucher is thinking "let me create something all women will then try to emulate and of course fail because I'm just that evil." No one noticed the lighting was changed? The skin tone? the dog? Should the subway platform be upset that it was extended a bit to cover up that distracting rail thingy? None of it is about the subject per se, its a fantasy. I doubt Lena Dunham has ever been in that bathroom, subway platform or worn those clothes prior to that day. I'll also bet that while her husband, or boyfriend or whatever he is bathes she doesn't sit on the side of the tub in her best party dress either. None of it is real at all, it's fantasy and for us artists it's all in good fun.